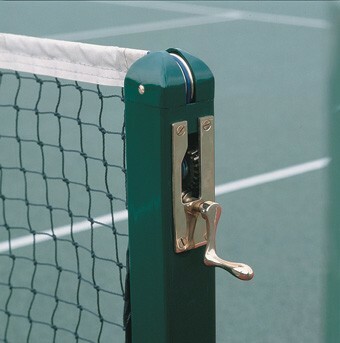 Excellent quality 76mm square steel tennis posts with nylon finish in green. These posts benefit from an all-British brass winder mechanism with detachable handle. Supplied complete with stainless steel tie bars for net fixing. Each set of posts consists of one anchor post and one winder post. When purchasing a new set of posts you will need to order a pair of sockets to suit - either galvanised steel or red oxide finished steel sockets with hinged lids. When ordering new posts to suit existing sockets further information will be required to ensure a standard set will fit correctly. Where necessary we can manufacture special tennis posts to fit existing sockets. These tennis posts are manufactured in the UK and spare parts are available.